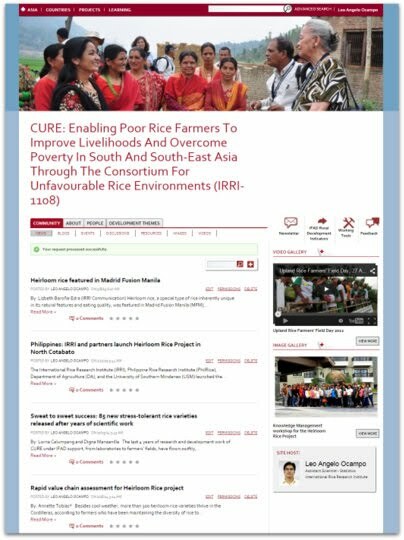 CURE Matters is a newsletter produced by the Consortium for Unfavorable Rice Environments (CURE) with support from the International Fund for Agricultural Development (IFAD). Challenging and complex biophysical and socio-economic environments for rice constantly confront CURE’s researchers, scientists, change agents, and communication specialists. 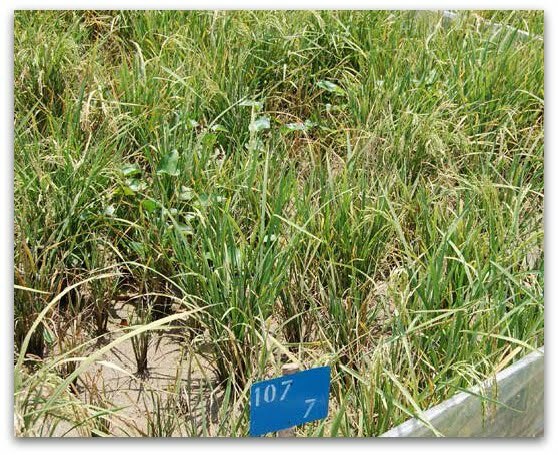 The response to short- and long-term challenges has been to a) seek ways to understand why such challenges occur in our rice environments, b) adapt measures to reduce unintended impacts, and c) work towards changing them to favourable scenarios. At CURE, we rely on strong partnerships to improve the pathways through which agriculture progresses, despite challenges brought by changing climate conditions in Asia. The models and interventions we study, test, and share with stakeholders reflect not just our commitment to developing the most effective methods and systems in agricultural practice, but they emphasize the spirited efforts of our partners in creating better options for resource-poor farmers in the region. 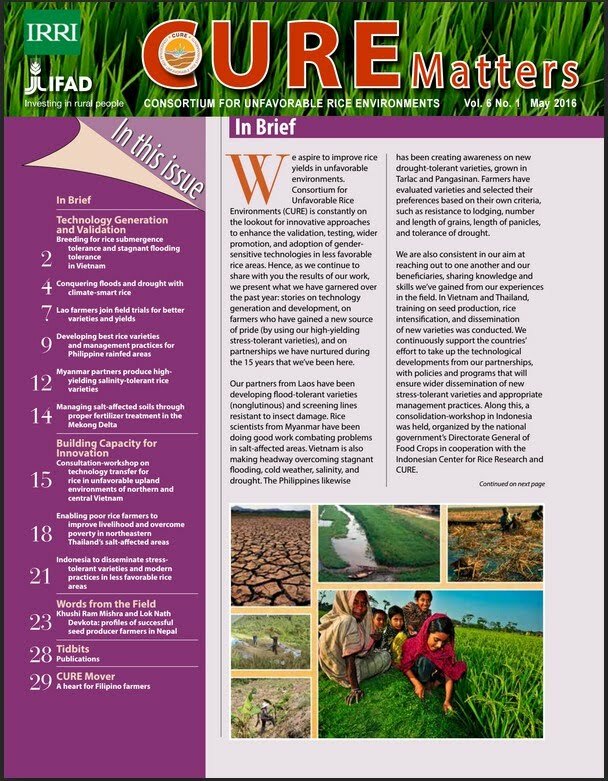 Hence, in this issue, we present our work in the past months – from innovations in rice research and lessons from field school experiences to esteemed names and personalities who have done some very good work in their respective countries. There are stories that accentuate the relevance of technologies designed to aid farmers in decision-making, as there are narratives reminding us of the value of knowledge sharing and learning. These are plucked from reliable mechanisms as the farmers field school (in the Philippines) and best management practices (BMP) case in Myanmar. This issue also provides an update on CURE’s technology development, validation, and testing of new varieties. The work of the “CURE movers”—these are scientists who work hard to create sustainable agricultural systems in the poorest, unfavourable areas in the region— are also featured in this issue. We share our experience in seeking ways to create and enhance value for traditional/heirloom rice varieties along the value chain. These endeavours are continuously pursued without let-up, as CURE keeps its eye on advancing processes in agricultural research and extension in the most marginal of rice areas, where many of Asia’s rice farmers live. As we continue to share with you the results of our work, we present what we have garnered over the past year: stories on technology generation and development, on farmers who have gained a new source of pride (by using our high-yielding stress-tolerant varieties). Read it now online. 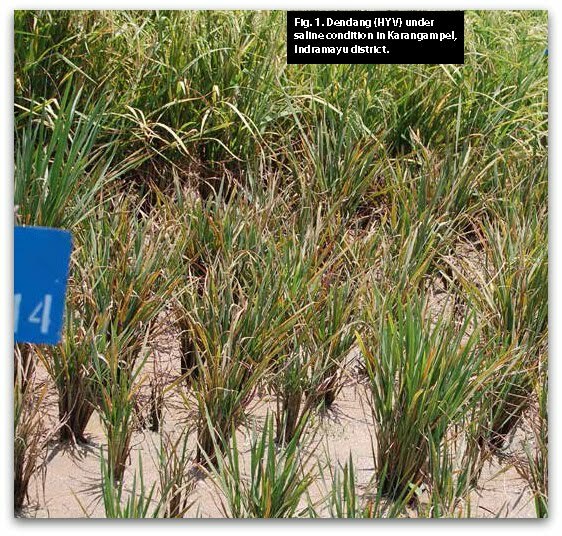 The major constraints in biotic stresses (such as sheath blight, blast, bacterial blight, brown planthopper, stem borer, thrips, and leaf-folder), abiotic stresses (such as acid sulfate soils, salinity, drought, and heat), the lack of varieties resistant to biotic and abiotic stresses, low yield in hybrid rice, too agricultural production in the Mekong Delta are stagnant yields in irrigated lowlands, few parental lines for developing hybrids, too few heterotic hybrids suited to both the Red River and Mekong River deltas, and poor grain quality of inbreds and hybrids. Worse, more rice areas have been converted to nonagricultural use each year. Rapid urbanization, industrialization, and demographic pressure have led farmers to use their marginal land for increased rice production to meet their family’s needs. With this, acid soils, tidal land, and forest land have been reclaimed and brought under cultivation, thereby limiting crop yield potential. In intensive irrigated rice-farming systems, major soil problems have included soil-mining effects and soil pollution. Fertility change is also a constraint. For instance, modern rice varieties exhaust soil fertility more rapidly than traditional varieties. Modern rice crops under intensive cropping (about 6 t/ha) remove from soils high amount of macro (NPK) and micro (Ca, Mg, S, Fe, Zn, Mn, Cu, B, and Mo) elements. Farmers usually compensate for these nutritional losses, especially macro-elements, with chemical fertilizers while neglecting some essential micro- elements. In the long run, the micro- elements become deficient and cause an imbalance in soil nutrition, an increased demand for phosphorus and potassium, and nitrogen inefficiency—ultimately affecting yield. It is within this context that scientists from the Cuu Long Delta Rice Research Institute, Institute of Agricultural Sciences for Southern Vietnam, and International Rice Research Institute are breeding rice varieties with submergence tolerance (ST) and stagnant flooding (SF) tolerance. Fourteen submergence- tolerant and high-yielding genotypes along with two standard checks plus a farmers’ variety were evaluated in a trial under naturally occurring submerged conditions. Different traits were assessed (crop duration, plant height, number of filled grains per panicle, percentage sterility, and other quality traits as well as submergence tolerance). 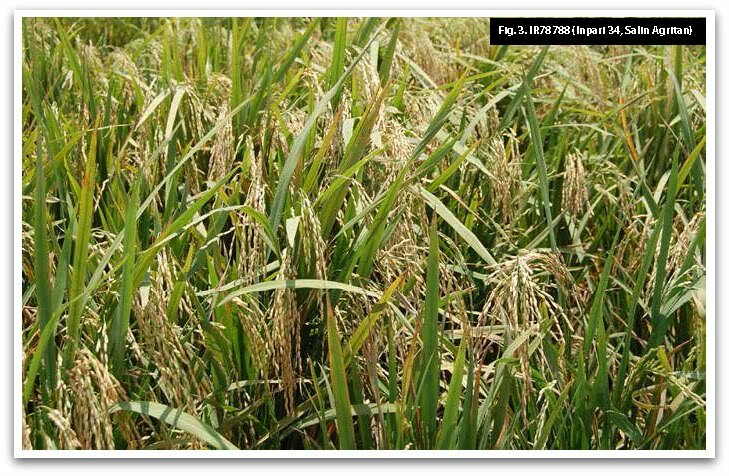 Lines that are early maturing (90‒110 days), semi-dwarf (90 to 110 cm), with a medium number of panicles per hill (7 to 15), and with a high number of grains per panicle (77 to 199) are selected for further testing in the rice-rice cropping pattern when their submergence tolerance is high (survival after 20 to 25 days of submergence with 0.8 to 1 m water depth) and when duration reaches 98 days, similar to IR42. The experiment suggested that the lines IR64-Sub1 and Pana were suitable for submergence. On-station evaluation of the genotypes under controlled medium stagnant flooding was conducted. The 14 genotypes were evaluated along with the standard check variety, IR64-Sub1. They were grown at the Cuu Long Delta Rice Research Institute for screening against natural medium stagnant floods. To evaluate performance stability, the 14 indica rice varieties were tested in different locations during the wet and dry seasons of 2014-15, using a randomized block design with three replications in each case. The experiment was conducted in the provinces of Bac Lieu, Can Tho, Hau Giang, Dong Thap, Vinh Long, and An Giang. The highest grain yield across the six sites was obtained from IR64-Sub 1 during the dry season. 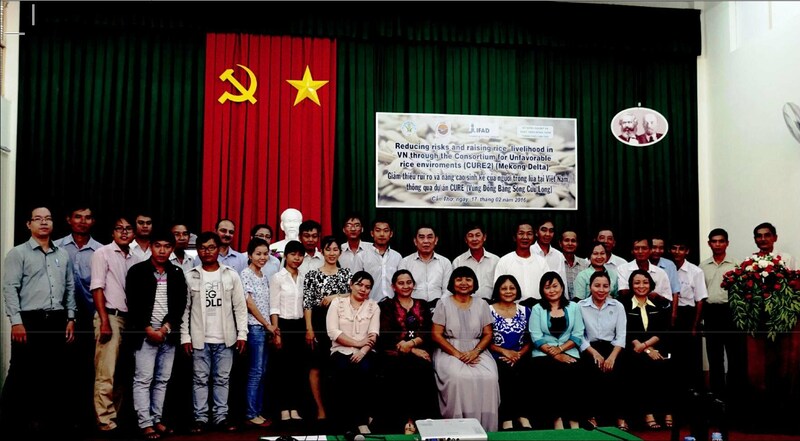 A training course for farmers and technicians was conducted during 2014-15 with 330 farmers (252 males and 78 females) coming from An Giang, Can Tho, Bac Lieu, and Hau Giang provinces. In 2015, two workshops were conducted to discuss lessons and other useful information generated from the project. Rewards for local staff who participated in the project were also given. The survey and evaluation done by the Cuu Long Delta Rice Research Institute brought about the following: improvement of 75 lines/elite rice varieties (ready for application for production); national testing of three rice varieties in two seasons; three rice variety candidates for national testing; and one rice variety candidate for DUS testing. In addition, several important characteristics were analyzed. The stability of rice varieties was also identified through the analysis of genotype by environment interactions. Dr. Nguyen Thi Lang is a collaborator of CURE. Printed in CURE Matters Vol. 6 No. 1 | May 2016. Page 2-4. 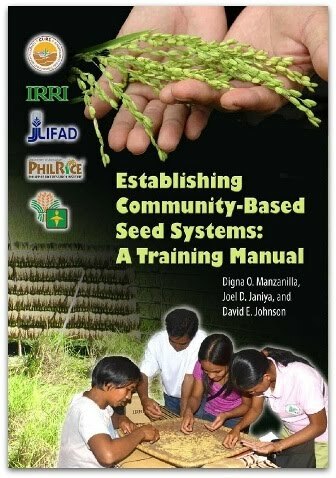 The IFAD book is a compilation of seven case studies that were identified for scaling up in the Philippines. As part of its pursuit to contribute to the Millennium Development Goals (MDGs), the International Fund for Agricultural Development (IFAD) has set accelerated targets for reducing rural poverty. Among other transformations, IFAD’s operational strategy has placed increased emphasis on “scaling up” of outcomes of projects to target the rural poor. IFAD’s past emphasis on rural innovation and learning has led to the emergence of many “good practices.” The challenge now is for CURE to deliver impact at wider scale. CURE participated in the IFAD-organized writeshop from September 1-5, 2014, “Writeshop on Scaling-up Frameworks in Selected areas of IFAD Country Programme in the Philippines.” The writeshop aimed to equip IFAD loans and grants project personnel to fully develop their cases or models of learning that can be shared with other development workers. 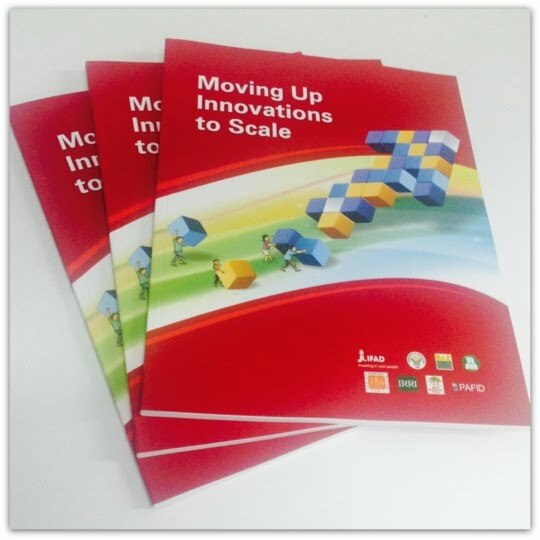 These are now published in a resource book, “Moving Up Innovations to Scale”, formally launched during the Knowledge and Learning Market and Policy Engagement (KLM-PE) on November 24-25, 2014 at the Bureau of Soils and Water Management, Quezon City, Philippines. Second Cordillera Highland Resource Management Project (CHARMP2), among others. 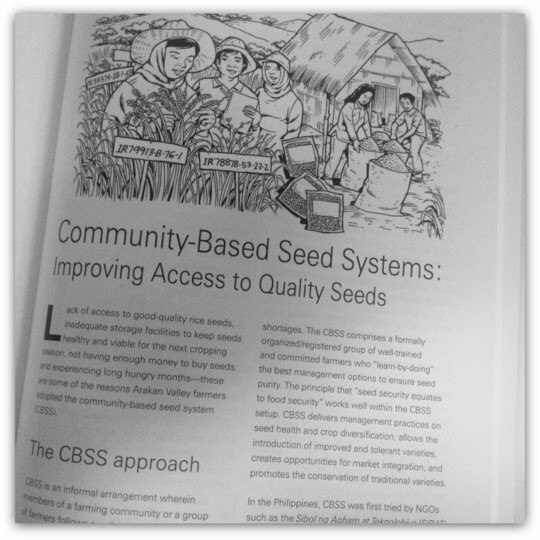 CURE’s article on community-based seed systems talks about how farmers will be able to raise their productivity and ultimately increasing income from sale of seeds. The identified cases have potential operational considerations on mainstreaming the scaling up approach into the IFAD country programme, including both project design and supervision. The CURE experience in identifying and packaging cases for upscaling will be applied for the consortium partners, so they can further develop the culture of impact acceleration that will reach more farmers benefiting from CURE research activities. Ms. Annette Tobias is an Assistant Scientist at International Rice Research Institute (IRRI). Printed in CURE Matters Vol. 5 No. 1 May 2015. Page 24-25. 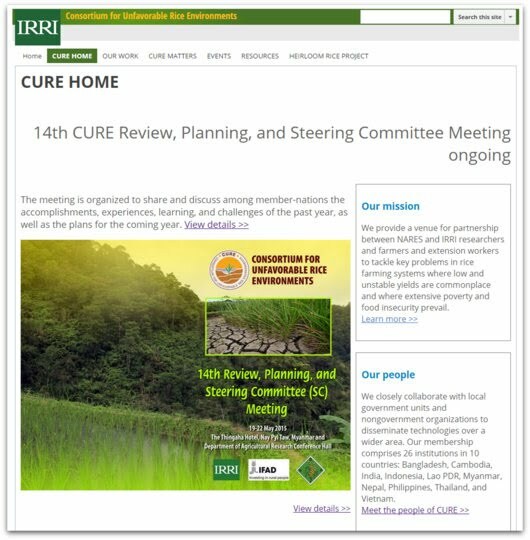 The CURE website can be accessed by just typing an easy to remember URL - cure.irri.org. 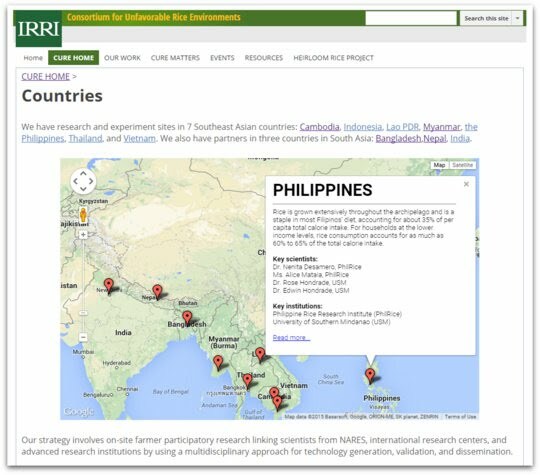 Alternatively, CURE website can be accessed directly from IRRI.ORG (the official website of the International Rice Research Institute). The sections are organized, so that users can easily find the information they need. It is mobile-friendly - use your phones or tablets and still view the contents in an optimal resolution. More stories, publications, and other materials can be viewed and downloaded. PEOPLE. Meet our workgroup leaders, steering committee members, NARES partners, and the coordination unit. COUNTRIES. Know more about CURE countries in the COUNTRY PROFILE page. 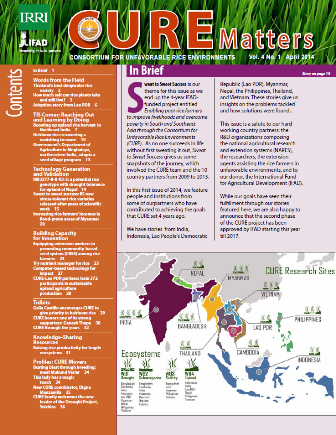 The information includes: an overview, map of stress-affected areas, key institutions involved, key scientists, released rice varieties, workgroups involved, and research activities. WORKGROUPS. Alternatively, information can also be viewed per workgroup. STRESS-TOLERANT VARIETIES. A list of stress-tolerant varieties can also be found in the website. EVENTS. Past events can be found in the events section. Users can view the program and the event details. To view all the materials for a particular event, click on the event details. Materials include photos, videos, Powerpoint presentations, outputs (for workshops with group activities), directory of participants, and other related materials. CURE MATTERS. Read share stories from the official newsletter of CURE. These stories are written by our NARES partners and researchers from 10 countries in South and Southeast Asia. The data can be filtered by ecosystem (drought, submergence, salinity, and upland), by country, by year, and by type of activity/material. The selection can be downloaded into an Excel or CSV file. HEIRLOOM RICE PROJECT. The Heirloom Rice Project (HRP) portal can also be found in CURE website at, which aims to consolidate the available knowledge resources on heirloom rice along the value chain. This special section includes news and events, resources/downloadable materials, and a directory. IFAD ASIA PORTAL. 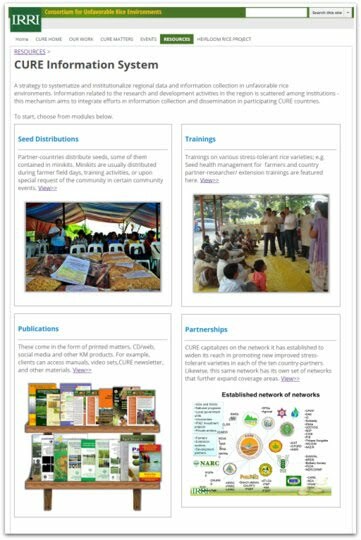 CURE also enhances its visibility on the web via IFAD Asia portal (http://asia.ifad.org/web/cure). News stories and events that are posted in CURE website are mirrored in IFAD’s website to reach greater audience. FACEBOOK. CURE posts updates through Facebook (www.facebook. com/cure.irri). We share news, stories and events as they happen to ensure an up-to-date delivery of information. The author was the site editor of CURE website and IFAD Asia portal. He also worked as a socio-economist and data management specialist of CURE. This article is printed in CURE Matters Vol. 5 No. 1 May 2015. Page 25-26. After Super Cyclone Paradip devastated Odisha, India in 1999, people started having problems with food. They couldn’t grow anything after the soil became too saline, except in the wet season. Aside from salinity, flooding is also a problem because the area was near a river mouth and the sea. Most of these soils used to remain fallow during the dry season. Through the Consortium for Unfavorable Rice Environments (CURE), Dr. RK Singh, IRRI senior scientist, and his team then decided to introduce some IRRI varieties considered to be elite cultures — especially for the dry season through CRRI collaborators —which were not only saline-tolerant but also early-maturing. The varieties were tested through participatory varietal selection (PVS) trials that not only involved farmers from the specific village affected by the super typhoon, but also farmers from neighboring villages. Slowly over time, they screened a few high yielding saline-tolerant rice varieties and around 2005 to 2007, a few hectares had already been planted to these varieties in the area. But it wasn’t until they introduced IR72046-B-R-3-3-3-1 that a considerable track of rice area became productive again. In the wet season, Dr. Singh explained that harvest is so low, didn’t have enough to last them through the dry season. But, when they were able to try the varieties, it became possible for them to grow rice even in the dry season. So they then had enough food enough for the whole year and were also able to sell some of the rice so they earned some money. They were also able to send their children to school. IR72046-B-R-3-3-3-1 was later released and commercialized as CR Dhan 405 in Odisha, and disseminated to large areas. “You know that is the satisfaction when you work somewhere, and you see the result going out of a specific village and into the neighboring villages,” Dr. Singh said. Within 2-3 years, the Stress-tolerant Rice for Africa and South Asia (STRASA) project reported through remote sensing that area grown to the saline-tolerant varieties started to increase. After three years, the area grown to the varieties had grown by more than 400%. “So that was one example, where we really ignited the hope of the farmers because they knew they had something good to plant even in the dry season,” he added. In the saline-affected areas of Khulna and Jessore in Bangladesh, Dr. Singh and his team also helped to not only further disseminate a variety that was previously developed from an IRRI project, but also taught farmers how to grow the variety for higher yield. Besides India and Bangladesh, Dr. Singh also have sites in Vietnam and Indonesia since he started working for CURE in 2005, and had led its technical working group on salinity. “At that time, I saw that things were not in good shape with the NARES partners,” Dr. Singh recalled. “They really wanted help but not just in terms of the technology. 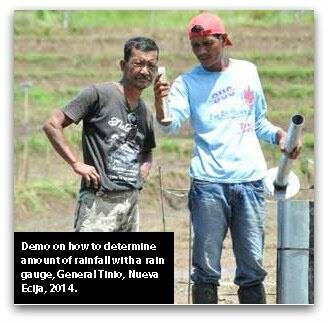 The technology is there, but they also want their capacity to be built up because IRRI scientists are not always there. So they need someone, who cannot only give them the materials, but also technical backstopping. So we were able to address those situations in CURE,” explained Dr. Singh. “The belief and trust of partners at the national agricultural research and extension systems in IRRI is at a different level,” he said. “I think working with CURE gave me more depth in understanding the different problems in unfavorable rice environments so that really helped me to become a better scientist,” he said. 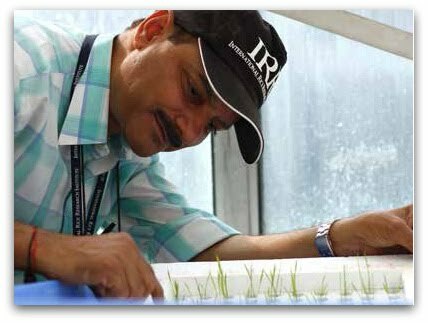 Dr. Rakesh Kumar "RK" Singh is a senior scientist and workgroup leader for drought in International Rice Research Institute (IRRI). He can be reached thru his email at r.k.singh@irri.org. This article is printed in CURE Matters Vol. 5 No. 1 May 2015. Page 27. 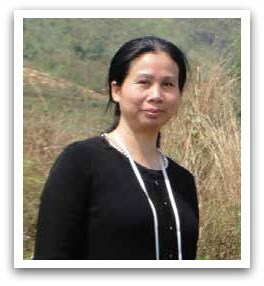 Dr. Pham Thi Sen is a researcher from Northern Mountainous Agriculture and Forestry Science Institute (NOMAFSI) in Vietnam, a partner in CURE’s upland working group. She plays a key role in coordinating CURE and other efforts aimed at sustainably managing agricultural systems, landscapes and environments in the Northern Mountainous Region (NMR), which is the poorest region in Vietnam. The NRM is characterized by diverse, complex and challenging topographical, soil, climate and socio-economic features. She has extensive experience in working with farming communities and local partners, and with her NOMAFSI team, has engaged in participatory R&D activities. She has successfully linked CURE initiatives with agencies such as the Food and Agriculture Organization, French Woman who matters Agricultural Research Centre for International Development (CIRAD), Australian Centre for International Agricultural Research (ACIAR), and with local government units - making their inputs and outputs well-complemented and synergized. The NOMAFSI team’s goal is to restore and protect the beauty and diversity of natural resources of the NMR, while sustainably reducing poverty of local farming communities, which is why its support to CURE is among its prime priorities. The team has provided support to farmers in different locations to restore local rice varieties, developed farm seed production and supply, conducted participatory varietal selections (PVS), and adopted integrated pest management, (IPM), integrated crop management (ICM), and conservation agriculture practices for rice. New salt-tolerant rice varieties, Inpari 34 Salin Agritan and Inpari 35 Salin Agritan, have been released in Indonesia. Multilocation trials show that their average yield is 5.1 tons/ha, and 5.3 tons/ha, respectively. Dendang (HYV) under saline condition in Karangampel, Indramayu district. Salinity is a major problem in rice production along coastal areas in Indonesia. Salinity damage to the rice crop frequently happens during dry season because of sea water intrusion into paddy fields. In many cases, farmers need to replant their rice field several times after sea water inundates it. An example is what happened in Karangampel, Indramayu district. To overcome salinity problem in rice areas, the Indonesian Centre for Rice Research (ICRR) released in 2014 two new salt-tolerant rice varieties named Inpari 34 Salin Agritan and Inpari 35 Salin Agritan. The two varieties were introduced by IRRI in 2008. Inpari 34 refers to IR78788-B-B-10-1-2-4-AJY1 while Inpari 35 is CSR90-IR-2. Karawang, West Java, October, 2010. These two varieties released specifically for salinity-affected lowland rice areas in Indonesia. Multilocation field trials of these two lines in affected areas began in 2010 and were completed in 2012. Inpari 34 takes 102 days to maturity, while Inpari 35 matures in 106 days. The two released varieties have hard cooked rice texture. In collaboration with IRRI through CURE, seeds of these two varieties are being multiplied at the ICRR experimental station for distribution to farmers in salt-affected areas in Indonesia. While dissemination of these two varieties is being done, breeding efforts to improve salinity tolerance of other rice varieties is continuously carried out at the ICRR. These two varieties have been used as donors in crosses with popular Indonesian varieties. Moreover, under the CURE project, field trials of other new salt-tolerant rice lines are underway in the key site Karangampel, Indramayu district. The authors are rice breeders from Indonesian Centre for Rice Research (ICRR). Printed in CURE Matters Vol. 5 No. 1 May 2015. Page 3-4. Much to their surprise and delight, farmers in a municipality in Central Philippines discovered that using seeding rates half of what they used to will bring them larger harvests and higher incomes. It consists of 13 barangays covering 68,230 hectares (ha), of which 3,215 ha (4.7%) are devoted to rice. Of this rice area, 61.5% or 1,975.88 ha is rainfed and cultivated by 1,171,631 farmers. A third (32.7%) or 1,052.30 ha is irrigated and the source of livelihood for 204 farmers and the rest (5.8%) or 186.75 ha is upland. In the study site, Barangay Rio Chico, 98% of the farmers practice wet direct-seeding in both irrigated and rainfed lowland rice areas, mainly to avoid the cost of transplanting and seedling pulling and to achieve early harvest. They use very high seeding rates of from 120 to 160 kg (3-4 bags) of pre-germinated seeds per hectare. This practice, according to them, allows for losses to birds, rats, and snails to which their crops are exposed, and to ensure high yields. They prefer to plant the early maturing (106 day’s maturity) irrigated lowland rice variety PSB Rc10, which was commercially released in 1992.
the stubbles, straws, and weeds during the fallow period. The cultural management recommendations generated from the Rice Crop Manager were employed in the trials. A field day was conducted on 16 October 2014 with 47 participants that consisted of 35 (74.5%) farmers, 9 (19.1%) extension workers, and 3 (6.4%) researchers. Of the participants, 64% were males and 36% females. During the field day, the participants harvested and threshed the 5 square meter crop cuts from the plots of different seeding rates and compared their harvests. The lower rates of 40-80 kg/ha yielded either higher than, or comparable with, those from the farmers’ traditional seeding rate of 120 kg/ha. Surprised and impressed, the majority of the male farmers agreed to apply low seeding rates in the following cropping season while a woman participant was willing to convince her husband to do so as well. Statistically, the computed grain yields obtained from the replicated trials across two farm sites did not vary significantly with seeding rate. The 120 kg/ha farmer’s seeding rate yielded 4.3 tons/ha while the rates of 40 and 60 kg/ha had yields of 4.1 and 4.6 t/ha, respectively. However, a partial budget analysis indicated a positive economic advantage in using 60 and 80 kg/ha seeding rates which resulted in increases in income of PhP 7,980 (USD177.30) and Php 7,740 (USD172), respectively. This increases in income resulted from 6.5% and 7.2% yield increase and 50% and 33.3% reduction in seed cost, respectively. Considering the total income attributed to yield increase and seed cost reduction, the 60 kg/ha seeding rate is recommended for wet direct seeding in the rainfed lowland for optimum gain in grain yield and income. Impressed himself by the results of the demonstration trials, General Tinio Vice Mayor and Sangguniang Bayan (Town Council) Chair Hon. Reynaldo P. Tamayo expressed full support for the duplication and outscaling of the participatory techno demo in the town’s other barangays, where appropriate. He committed to provide the necessary inputs for the activity. PhilRice, on the other hand, committed to provide the technical expertise and supervision to the LGU extension workers and farmer-partners in establishing the demonstration trials. Through this outscaling, more farmers are expected to use low seeding rates, thus increasing their outputs and incomes and earning for themselves and their families better standards of living. Producing rice is a gradual process that requires close attention to details to ensure good crop growth and high yield. This step-by-step process applies the best possible technologies and practices to manage technology-delivery at specified time related to crop growth stage such that inputs are used more efficiently. These practices can be bundled into a package, dubbed Best Management Practices (BMP), that serves like a ‘basket of options’ for extension workers as they guide farmers in the proper use of technologies. This can lead to farmers producing rice more effectively and efficiently. With BMP, farmers can increase their yield and reduce cost of production, and can minimize pollutants in the field thereby preserving the environment. The development of a BMP is tedious, taking into account data gathering, documentation, meetings and consultations to come up with one final version agreed upon by stakeholders. This process may be modified to suit the local situation. The experience of Myanmar is a good example to demonstrate such process. 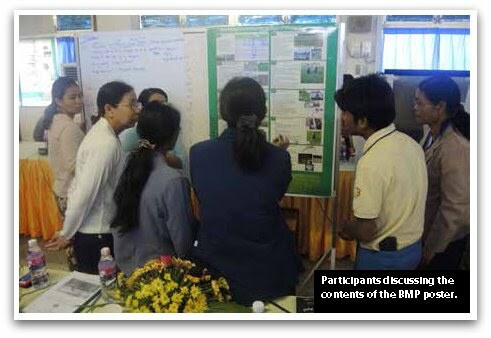 A generalized BMP was developed and was given to Myanmar partners to revise based on their research results and practices in the field. A small group worked on the materials (ex. BMP in TPR for drought-prone environments) to localize the content. The material was then submitted to colleagues (i.e. breeders for recommended varieties; pest and disease experts to address pest management, etc). After a series of consultations and discussions on the draft materials, a 2-day workshop was conducted to further discuss, refine, and revise the content. 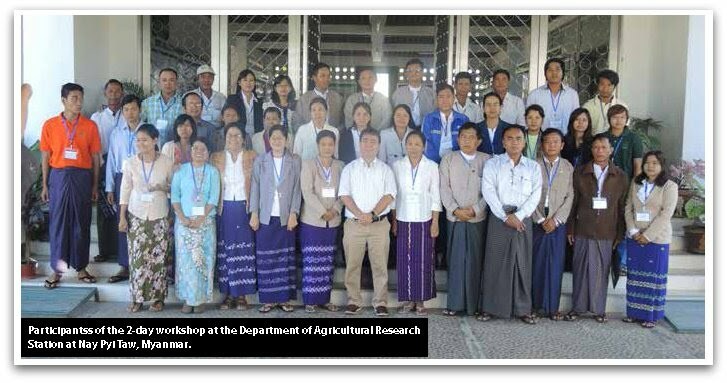 The participants of this workshop were staff from the Department of Agriculture (DoA), Department of Agricultural Research (DAR), Yezin Agricultural University (YAU), International Non-Government Organization (INGO) working with the LIFT Project, and IRRI. Farmer leaders were also present. The Director of DAR, Dr. Ye Tint Tun, participated in the discussions. The facilitators of the workshop were Dr. Khin Thawda Win, IRRI Post Doctoral Fellow under LIFT B Project, and Dr. Romeo Labios, agronomist under the ACIAR & LIFT A projects. The output of the workshop included BMP posters for the following categories/purposes: BMP for direct-seeded rice; BMP for transplanted rice; BMP for alkaline-affected soils in BMP for flood-prone and saline-affected areas. These materials, already translated in Myanmar language, are awaiting approval of the Ministry of Agriculture and Irrigation Services. *Mr. Joel Janiya is a senior associate scientist and agronomist from International Rice Research Institute (IRRI). 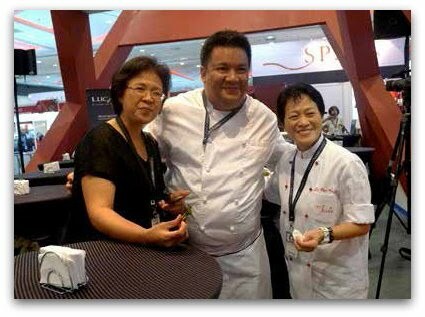 The IRRI-DA-PhilRice funded project participated in the Madrid Fusion Manila (MFM), held in SMX Convention Center in April 24-26, 2015 where Chefs Robby Goco (middle) of Green Pastures, Shangri-La and Jessie Sincioco (right) of Rockwell Club, Makati, and Ms. Amy Besa (left) of Purple Yam, Malate were paired with the IRRI team and provided them with heirloom rice varieties for the Food Tunnel event. Heirloom rice does bring a lot of creative possibilities to the palate; but more than that, it’s an interesting product because it has fused or blended, in such an ingenuous way, the strengths of culture, science, and a burgeoning niche market. Heirloom rice is capturing public attention as it has never before. Thanks to the DA-IRRI-funded Heirloom Rice Project (HRP) titled, “Raising productivity and enriching the legacy of heirloom/traditional rice through empowering communities in unfavorable rice-based ecosystems.” Its slogan is aptly titled, “Capturing Value, Preserving Heritage.” The HRP, which started in February 2014, is funded by the Philippine government and took shape via the established partnership of IRRI and the Cordillera Highlands Agricultural Resources Management Project, an International Fund for Agricultural Development (IFAD) investment project in the country. It was then under the technical innovation services (TIS) component of the Consortium for Unfavorable Rice Environments (CURE). The project embodies excellence in science in action. Biological scientists are working hard to characterize and establish the purity of the heirloom varieties. A systematic process of characterizing the varieties is being followed. The project undertakes collection and cataloguing of varieties from 17 project sites covering four provincial areas. After panicle characterization of 41 varieties at IRRI, the variants (varieties of the same type having distinct traits) reached a total of 74. These indigenous materials or variants were returned to the Cordillera farmers to be grown onsite for further observation of traits, while closely superved by HRP staff at different growth stages in a process called participatory heirloom rice trial (PHRT). DNA analysis is used to provide some critical answers to the scientific experiments, such as how related or distant a particular variety is to another variety in a single location or how similar a particular variety found in one province is to that in other provinces. The project will put together the information about the varieties in a community registry, in a pioneering effort and partnership with the DA-Bureau of Plant Industry (BPI). This will protect the indigenous peoples’ (IPs) claim to their traditional varieties and will inform the public of variety ownership. The project also investigates grain quality and nutrition. Scientists are exploring heirloom rice’s high nutritional values (Fe, Zn, and Mn contents) and antioxidant properties. As farmers’ cultivation practices, culture, tradition, and aspirations are essential ingredients to the novelty that is the heirloom rice, HRP has likewise assessed the various activities along the heirloom rice value chain through a four province rapid value chain assessment. Participatory needs and opportunities assessment, profiling of self-help groups, gender analysis, and baseline studies have also provided useful information on who are involved, and where, how and in what capacities are the varieties being grown. The farmers’ chosen heirloom rice varieties are geo-tagged. Site-specific analyses of biophysical and socioeconomic data guide project staff in coming up with appropriate interventions. The IRRI-DA-PhilRice funded project participated in the Madrid Fusion Manila (MFM), held in SMX Convention Center in April 24-26, 2015. 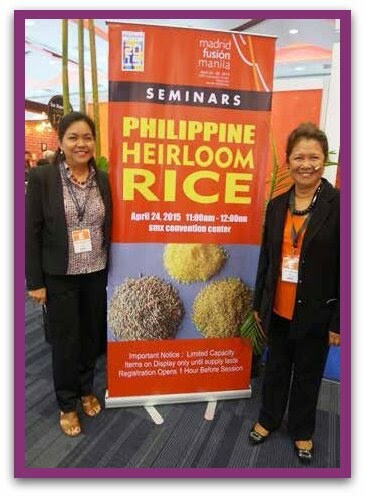 The two project leaders, Dr. Casiana Vera Cruz (right) and Dr. Digna Manzanilla (left) gave lecture in the Seminars and Food Tastings event of the MFM. HRP works through collective action among many IP groups to preserve their culture and improve their food values. The project covers 11 self-help groups representing 682 heirloom rice farmers, 75% of whom are women. These farmers cultivate heirloom rice in the Cordilleran rice terraces, which have been included in the UNESCO world heritage site for preservation of cultural landscape and people-scape. The terraces and heirloom rice have become part of their heritage and everyday life. Vicky Garcia, Director of Revitalized Indigenous Cordilleran Enterprises, Inc. (RICE, Inc.), considers the varieties as gems to the people of Cordillera. “The whole culture is built around them. Farmers have their own seeds, which they own like treasures, handed down from generations. These seeds are gems that go back to the farmers from harvests,” she says. Amy Besa of Purple Yam Restaurant explains that losing the varieties equates to losing the terraces and, consequently, losing our pride and the reputation established by Filipino farmers. Farmer leaders Sally Donque, Ana Habilling, and Saturnina Wadingan emphasize how valuable the rice and the terraces are. They say that the terraces have to be revered in the same way as their families’ heritage is revered. With the project, they constantly look forward to having good, healthy seeds that translate to good harvest and income for their families. There is a niche market. The quality and nutritional benefits as well as the social, cultural, and environmental impacts have created a growing interest in heirloom rice internationally and, more recently, in domestic markets. Health buffs and gourmet cooks have started to pay attention to heirloom rice as an alternative menu in their meals. In fact, with renowned chefs finding distinctive tastes in these varieties that go well with traditional and gourmet dishes, the possibilities of expanding the niche market for heirloom rice are endless. The farmers’ attachment to their heirloom rice is coupled with their enduring preference for traditional farming practices, which in many aspects is equivalent to organic farming. This poses much potential for heirloom rice to penetrate the steadily growing niche market for organic rice. HRP is working to facilitate the organic certification of its farmer-partners. Likewise, capitalizing on the environment-specific desirable qualities of heirloom rice, the project is also facilitating the protection of select heirloom rice varieties under the geographical identification (GI) protection system. The most important criteria for GI protection are the product’s history and reputation. HRP will be making the most of the site-specific, biophysical, and socioeconomic data collected in its research activities to establish these two important criteria for the Cordilleran heirloom rice, as well as for the construction of corresponding codes of practice. The GI can secure a product’s place in the market and serve as a branding strategy. The project is conducting activities to build capacity and steer farmers toward good agricultural practices, market competitiveness, and organizational development. The Philippine Rice Research Institute (PhilRice) and the DA-ATI provide training through farmers’ fields schools (FFS) on pre-production, production, processing, and postharvest. The Department of Agriculture Cordillera Administrative Region (DA-CAR) has been creating opportunities to improve product quality by providing the appropriate machines and equipment. Recently, the project has linked up with the Department of Science and Technology-Industrial Technology Development Institute for the skills needed for packaging, labeling, and prolonging of the shelf life of heirloom rice. HRP is also working with the Department of Trade and Industry-Intellectual Property Office in helping establish Cordilleran heirloom rice’s definitive reputation for GI protection. The project’s need-based approach led to tieups with local government units, most of whom are considered “local champions,” and the state colleges and universities for the research and assessment activities. 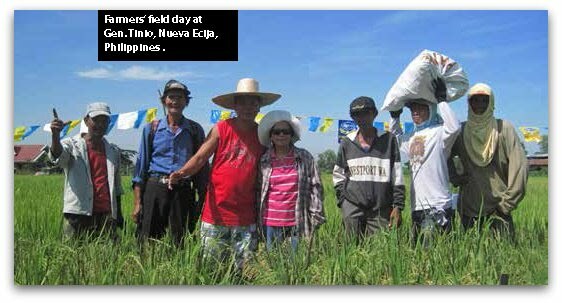 The non-government organizations (NGOs), RICE, Inc. and the farmers’ organizations are partners as well. Finally, HRP is linking heirloom rice farmers to the market through consumer preference research and awareness campaigns. 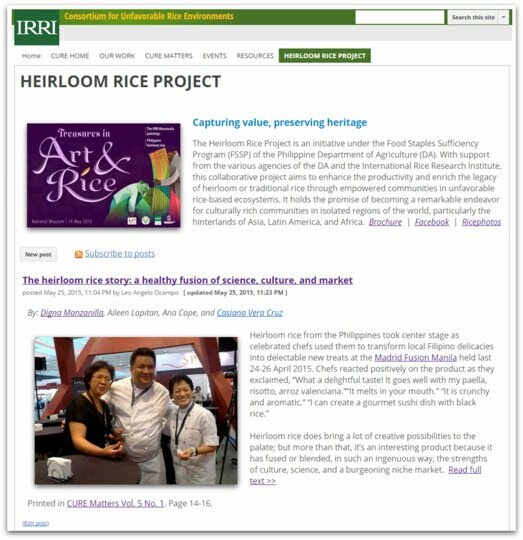 The project continues its partnership with chefs, restaurateurs, traders, NGOs, and other groups in the development of heirloom rice-based recipes and in product promotion. Such linkages reflect the project’s value of inclusive partnership for local capacity enhancement of farmers and other stakeholders. The HRP aspires to address productivity and income problems of heirloom rice farmers through interventions that cut across stages of the value chain. It aims for the delivery of preferred heirloom rice varieties that were selected and characterized for food security, increased yield, and market demand; for a highland/upland smallholder heirloom rice enterprise that is linked to value chain; and, most importantly, for conservation of the biodiversity of rice varieties and preservation of cultural heritage in the rice terraces. It is a good story to tell, a story whose core is to keep our indigenous peoples’ traditions alive. Science fulfills its function so well in this endeavour—that of preserving diversity in culture, in people, and in rice that stood the test of time. *The authors are scientists from International Rice Research Institute (IRRI).